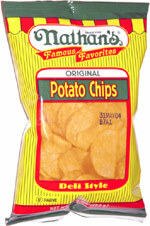 Taste test: These were good standard potato chips. The cut of the chips was a bit thicker than your typical chip. They were about average as far as crunchiness and crispness, not a standout in either category, but they had a good potato taste and a good helping of salt. This medium-size bag wasn't filled all the way to the top, but it did contain a pretty good number of chips. Smell test: Good, like a baked potato. This snack was discovered by Jeremy at Molly Pitcher Rest Area on the New Jersey Turnpike. Review published .